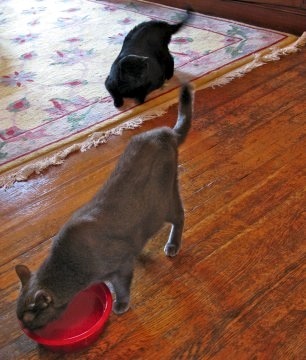 Stacy Horn » Blog Archive » What is the fastest way to move cats in an emergency? What is the fastest way to move cats in an emergency? During the earthquake yesterday, I looked over at one of the cats and realized immediately I had no way to get two cats out of the apartment quickly. What is the best solution?? Is there a good solution? I’d feel better if I could come up with something. I’d need something to fit two cats, something that I can lift, and carry down four flights of stairs, and it should probably be on wheels for when I get downstairs. Ugh. Maybe a big thing and a wagon. I wish I could store the wagon under the stairs on the first floor, and then my only issue would be getting them downstairs. Oh, I am SO getting a chihuahua next. Other than saying to them- Please stay in the apartment and don’t run outside’? I would be tempted to look at a solution utilising a backpack so moving down stairs is easier, some kind of closable container that lets them breathe (obviously) that fits in a backpack or can be strapped onto your back. Some air travel carry on bags/rucksacks have both back straps and wheels and would be roomy enough for two cats in such an emergency. Just need to make air holes/vents in the material. I hadn’t given this much thought and I have three cats to deal with. You know that a pillowcase would make a good temporary carryall. I’ve had to use one in an emergency situation with an injured cat when I didn’t have a container nearby. I always figured I would have enough time to corral everyone, stick them in their respective carrier and put them in the minivan. A dog carrier would be my 1st thought, one of the larger ones. Put one in, then catch the other one and put that one in. I know, easier said than done, and it’ll be uncomfortable for the cats, but I’m assuming there’s no time to be gentle about it. Karen, I think I tried a pillow case when there was a fire in my building and I couldn’t get the cat in the pillow case. I think the dog carrier is totally the way to go. Great idea, thanks! !